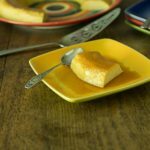 A rich and refreshing custard which is a favorite dessert throughout Spain and Latin America. rich and creamy with a melted caramel sauce. In a blender place all of the ingredients except the sugar and blend well for about 3 minutes. In a skillet (not Teflon) on medium place the sugar and stir constantly until it begins to turn a light brown (caramel). Pour caramel into the flan pan tilting so the caramel can coat the entire bottom of the pan. Allow to harden. Put the egg mixture into the flan pan and place on top of pot of boiling water. Cover with tin foil, and poke 8-10 holes all over the foil to avoid condensation to form. Cook for approximately 45 minutes. Check after 30 minutes by slightly lifting the aluminum foil and inserting a cake tester. To make sure it is completely done, give it the jiggle test. If the flan jiggles slightly then it is done. You can also insert cake tester or skewer to test for doneness. The tester should come out clean. Cool on a wire rack for about 1 hour before inverting onto serving platter. To serve, run a sharp knife all around the edge of the flan mold. Place a large plate on top and invert carefully. Cool completely in refrigerator before serving.